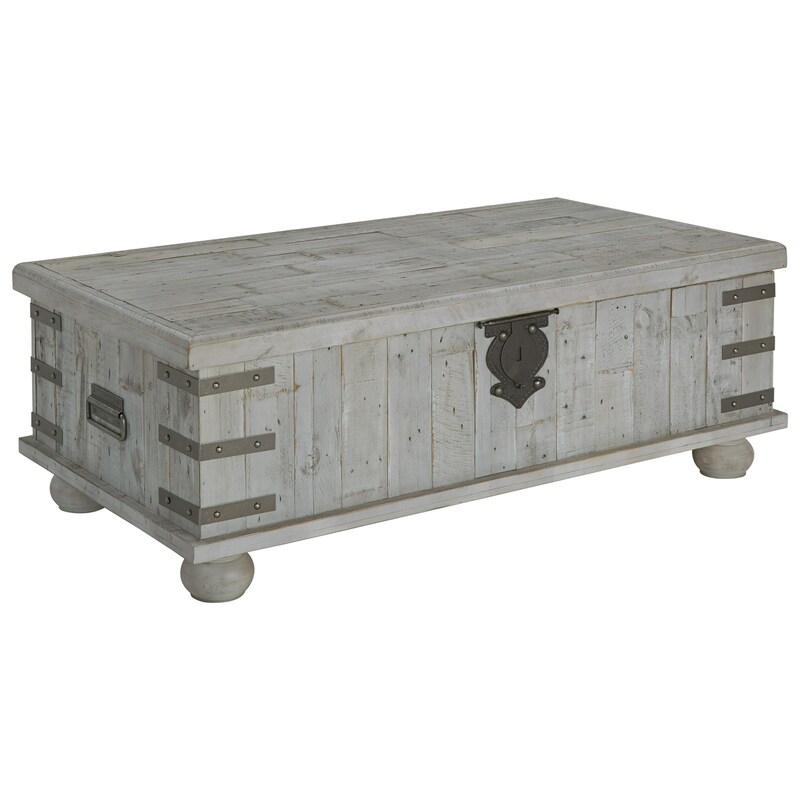 Constructed with reclaimed solid Pine in a light gray finish to highlight the natural beauty of the wood grains, this gorgeous cocktail table drawers inspiration from the look of antique storage trunks. The planked and butcher block wood effect, combined with the metal bracket detailing, creates the charming industrial look of this piece. Inside of this lift top coffee table is a large, fully finished cavity for optimal storage space. The Carynhurst Industrial Lift Top Cocktail Table by Signature Design by Ashley at Miskelly Furniture in the Jackson, Pearl, Madison, Ridgeland, Flowood Mississippi area. Product availability may vary. Contact us for the most current availability on this product. Reclaimed Pine solids are transformed into these stunning occasional pieces, which are brimming with style and functionality for your home. The Carynhurst collection is a great option if you are looking for Industrial furniture in the Jackson, Pearl, Madison, Ridgeland, Flowood Mississippi area. We are enjoying our table. When we placed the order I did not realize how much space the table would take. It looks great and is really helps hide some of the clutter.